Pop-up flash needs careful use... it can be harsh and unforgiving. Highlights are those bright spots that are complete white spots. Flash, pop-up flash in particular, is prone to create these highlights. The very small and direct light source creates harsh or hard light. Particularly on faces, highlights are ugly. The appearance of bright white areas on a face spoils shots and distorts the looks. Flash also tends to give faces a slightly blue/white tinge, making the flesh look washed out. People with faces affected by this flash effect look as if they need several good nights’ sleep. In addition, Pop-up flash is direct onto the face and in-line with the lens. This often causes a harsh under-chin shadow that slices across the neck. 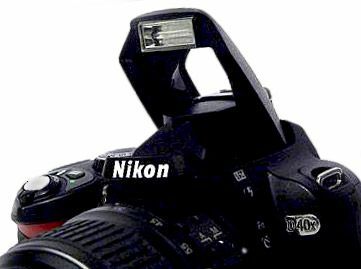 An alternative is to consider buying an off-camera flash unit. These are much more controllable than pop-up flash units. They also give you a great deal of flexibility in what you can shoot and how you do it. Find out more about off-camera flash. This entry was posted in Background Info., Composition, How to..., Starters School and tagged Flash, How it works, How to Shoot, Light, Technology. Bookmark the permalink.